The bright colors and giddy atmosphere of Damsels in Distress seems to be a perfect remedy for the frat boy dorms that plague the campus of Seven Oaks University. Although Damsels is the latest film from Whit Stillman, it’s hard not to think he was simply shooting this adorable comedy across campus while Animal House filmed on frat row. They seem to come from the same universe, and Damsels feels dated in that way, but it’s perfectly appropriate for this sun-soaked narrative of the bizarre and totally delightful. Stillman, for those who know him, has been absent on screen since 1998’s The Last Days of Disco, another period piece of a period not so far away. Damsels isn’t a period piece, but with its syncopated dialogue, 1950s soundtrack, and song and dance numbers (oh yes, there is tap) Stillman creates a film that is very much in its own universe. Or at least everything is seen through the rosy eyes of the narrative’s protagonists (“The Damsels” as the opening credits refers to them). The film begins with Greta Gerwig, making her move from micro-budget mumblecore darling to full-fledged actress, as Violet, the queen bee leader of a gaggle of girls at the prestigious university. 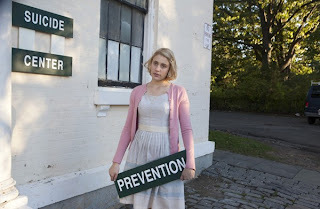 Violet, along with Heather (Carrie MacLemore, a one-liner machine) and Rose (Megalyn Echikunwoke, confident through every line), hope to make the world a better place by running a Suicide Prevention Center, though everyone refers to it as the Suicide Center. Early in the story, they took on jean-wearing transfer student Lily (Analeigh Tipton, who some may recognize from Crazy Stupid Love), and hope to transform her as well into a harbinger of peace and love of a campus desolated by fraternities, so low that they have Roman names instead of Greeks. Stillman shows the Damsels as a universe onto themselves, not too far out of television shows like The Wire, where you have to get used to the language, as well as its pace of it as well. Everything feels like a complete artifice in the film, from the cotton candy dresses to the blindingly white cinematography. But instead of feeling twee, Damsels in Distress commits fully to its universe, and thus never feels like it’s playing a joke on these characters. Plus, plenty of other members of this world (including a scene-stealing Aubrey Plaza) comment about how much they hate the Damsels, though never in a meta-way. The narrative follows some usual routes you’d expect in a college comedy, as the girls struggle over the trials and tribulations the men of the campus (referred to as “Their Distress” in the credits). Violet tries to remain above the fray, preaching about her remedies of soap and a new type of dance, but can’t avoid falling into the same traps as well. But Stillman never gives these romances a life or death density as many other narratives do; everything is treated with such light and frothy atmosphere, so much that he eschews narrative cohesion for an extended homage to Astaire and Rodgers. It’s a bit frustrating that the film does seem to skip any plot resolution by moving into the farcical, but like everything in Damsels in Distress, Stillman is less interested in classical narrative structure as he is in creating a world of delight (even a plot line that deals with some pretty odd sexual themes is given only the lightest of importance). While Gerwig may have started in films by playing essentially herself for directors like Joe Swanberg, she makes the transition easily to something with less nuance but more technical skill. She knows how to carry each line without giving it the meaning one would usually expect (“Thank you for your chastisement,” she tells a friend, and with a truthful gratitude behind it). Gerwig has a long career ahead of her, specifically because she can not only play roles that ask her to play only herself, but roles like Damsel that are false at every moment. But Gerwing doesn’t make these feel false—they are true to a character that can’t understand reality. Plus, how many actresses could make the ecstasy of smelling soap feel authentic? Damsels is pure delight, and Gerwig makes it so.